Previous: Test Gas Gas EC 125 Racing 2014: the 125 2-stroke is back! Comparative motorcycles Yamaha MT-09 vs. 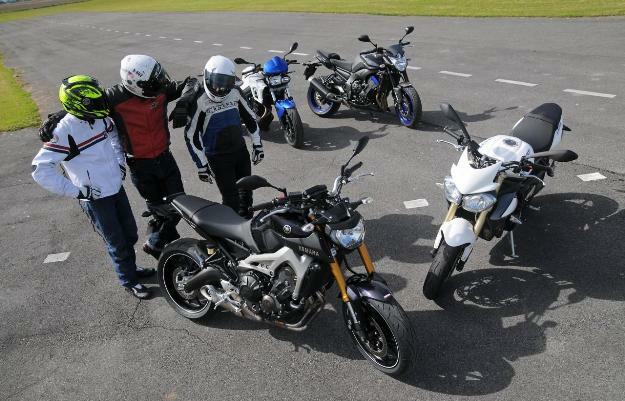 Triumph Street Triple 675 vs. BMW F800R vs. Yamaha FZ8: comparative 2014! Real phenomenon, the Yamaha MT-09 impressed us during our first test press. 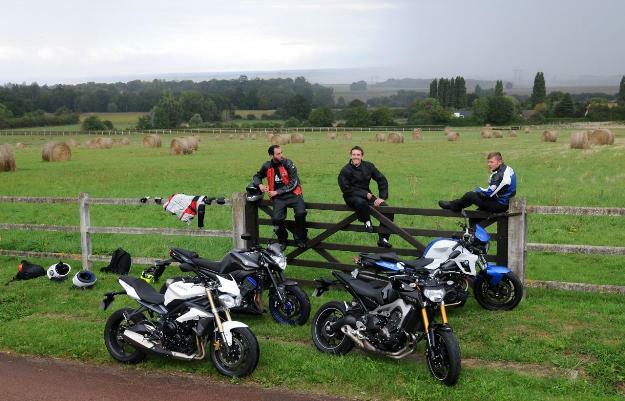 But that is really worth its 3-cylinder Triumph Street Triple 675, BMW F800R and Yamaha FZ8 compete in actual conditions of use? Here’s the first shock 2014 on the bikesdoctor.com with measures! The new Yamaha MT-09 is a gamble at high risk for the moment: with its unique 3-cylinder in line, this roadster aims to attract a wide audience by cultivating a strong personality, mechanical, aesthetic and ergonomic. Suffice to say that it should dare to do so, because even if Yamaha is not in his first attempt (VMax, TMax, R1…), the ‘Maximum Torque’ 09 will find against it the gratin to a highly aggressive category and in place. 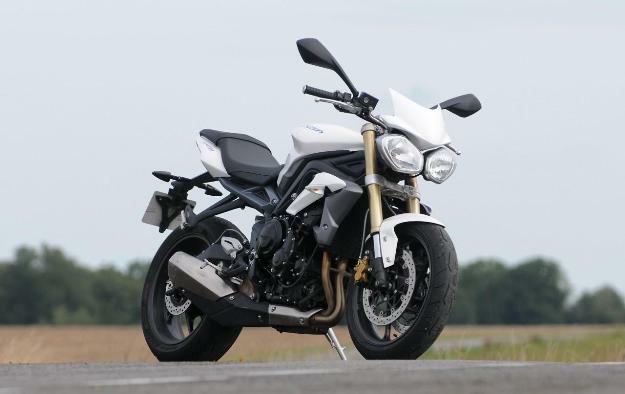 Starting of course with the Triumph Street Triple 675 that has reinvented the popular 3-cylinder is a reference in terms of accreditation and performance among roadsters sports midsize, but not demerit not facing higher displacements, all at a target price. It is the competitor n ° 1 of the Yamaha MT-09, but not only. As in engines ‘original’, vertical twin-cylinder BMW F800R also arises as an alternative to the sacred Yamaha MT-09. BMW F800R is also a reference in road behavior and in versatility. 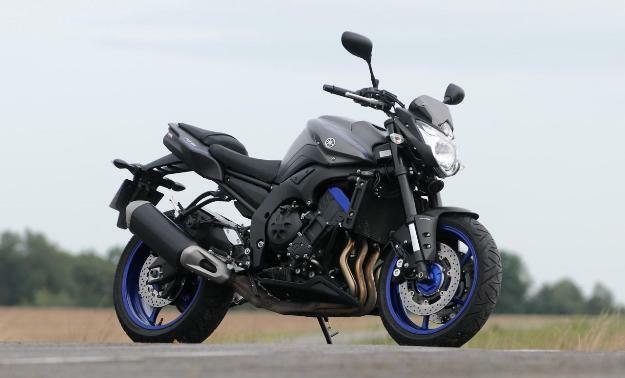 Finally, in its own family, Yamaha MT-09 is going to find on its way Yamaha FZ8, at the same program of which 4 – online cylinders aim, on the road and on the carpets of concessions seen as they are shown at the same price! 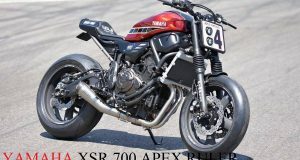 In short, new concept, three competitors of size – and others that we could include in this first match – and category of best-selling bike in World, here arises as a very successful challenge for this ambitious Yamaha MT-09. As usual, the bikesdoctor.com brought together this entire beautiful world for an impartial game: impressions ‘on’ and ‘off’, various measures and a few hundred kilometers later, here’s all you need to know about the 3-cylinder before deciding to buy it… or not. Vs. Yamaha MT-09 inside! Its output in 2009 original (eh Yes, already! ), the BMW F800R is always in 2013 with an elongated line and unique color. Here in ‘racing stripes’ version, it has a beautiful quality of manufacture, although Toro hardware is sometimes too apparent. However, the integration of options (handlebars, on-board computer) is impeccable, as always at BMW. Morality, this roadster is serious, mature. 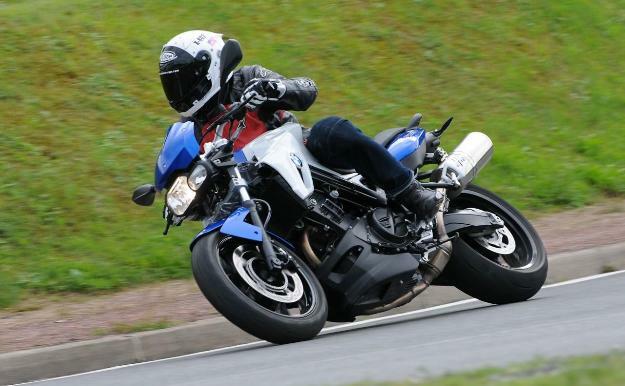 In the saddle, the BMW F800R differs among others from the Yamaha MT-09 by a relatively elongated position (much like on the Triumph Street Triple); the foot high enough to preserve the ground clearance and a handlebar at the drooping ends as the Yamaha FZ8. Not as narrow as the Triumph or the Yamaha MT-09, the BMW F800R household still the most beautiful living space on board, whether for large or small who will appreciate an arcade in the crotch as well worked at BMW. The parallel twin cylinder delivers one sound sports and less metallic than others: here again, the bourgeois BMW stands. 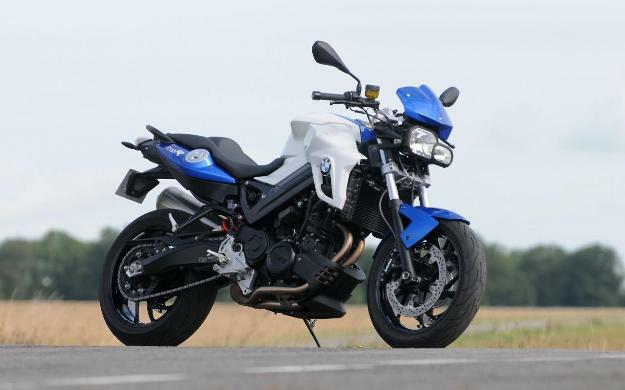 Upon taking hands, flexible twin and very decent turning radius make the BMW F800R as good urban bike that Yamaha FZ8. In addition, for troubleshooting in duo, the BMW remains the most appropriate: it only has passenger series handles and his saddle is the most comfortable of the lot, on a par with that of the Yamaha FZ8. On the road, the longer wheelbase of the band (1,520 mm) or the presence of the single direction of the comparative damper attend probably the subtle mix of handling at low speed, agility in the sinuous and straight as cornering stability. BMW F800R has efficient and comfortable geometry: it is easy and safe. BMW is probably the most relaxing to take with overall ease and its slightly reclined position that offers the least resistance to the wind. This is an advantage over highway that almost makes you forget the twin vibration. In addition, it is sufficient to address the same potholes riding the BMW and the Triumph for example to understand the Bavarian absorbs shocks better. In sports driving, cycle is so much at the level of the other, but it is its engine, which then step. With 84 horsepower measured at the wheel, the BMW F800R makes 20 others. What invariably feels the acceleration? In occasions, despite 8.1 mkg of torque at the rear wheel – only 0.4 mkg less than Yamaha MT-09 – the BMW F800R cannot only bowing. In addition, the shape of the saddle does not help to move and the left heel sometimes stumbles on the elbow of the exhaust. Disturbing only in sports driving, it is. The ABS also triggers too early in constant use, especially at the rear, when the added engine braking during deceleration. 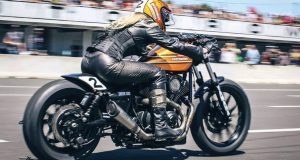 Balance Sheet: pending the engine of the Nuda? Morality, the BMW can fight on the sports section and to have a beautiful fully equipped BMW F800R, one must of course resort to options packs. BMW may find the solution by grafting the 900 cc engine of the Nuda, which will soon disappear. By 2015, who knows…? Although having abandoned its chrome round optics and cans under the saddle in 2013, the Triumph Street Triple retains no less a very neat appearance. The finish is difficult to criticize a motorcycle sold less than 8 €000 without ABS. Certainly, the Yamaha MT-09 is at the same price despite its 172 additional cm3 and superior amenities – like radial calipers-, but overall, the Triumph Street Triple is a must. Its three-cylinder has a remarkable chest at all, worthy of a flexible four-cylinder, a melodious air box and a superbly calibrated injection which does not smoothly. Opposite, Yamaha MT-09 may take seed, same for the selection that stays more enjoyable on the Triumph (but still a bit firm daily). Side coziness and charm so, the street triple Britton still has its word to say against the three faces a three-cylinder Nippon. It is above all the raw side the match turned in favor of the Yamaha MT-09, including times when the Yamaha manages to dominate our Triumph Street Triple 675 press, incidentally, yet strong pedaling performance … In B (soft) mode, Yamaha struggled to outrun the Triumph, that’s how the 675 is powerful, despite his handicap displacement. However, once the coating is appropriate and the road becomes tortuous, the coziness and the sporting potential of the Triumph are flying. Lightweight and equipped with an ergonomic design quite similar to that of the BMW (light support on the handlebar, foot rests, senior, appreciable narrowness); the Triumph Street Triple 675 presents the train before the more accurate of the comparative. Triumph cleverly calculated resistance to twisting of its chassis as the work of the train. 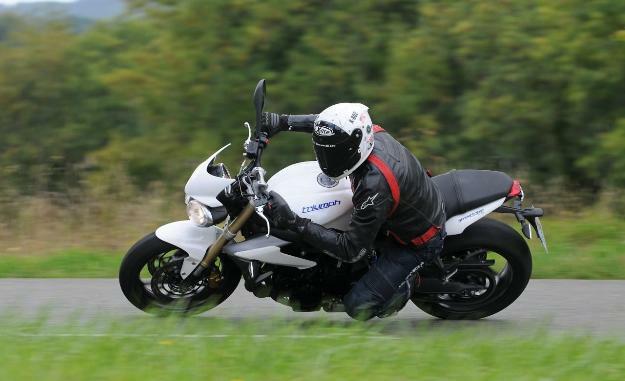 Result: the Triumph Street Triple 675 reassures input curve, fits beautifully on the corner and spring brilliantly through the progressiveness of its engine. 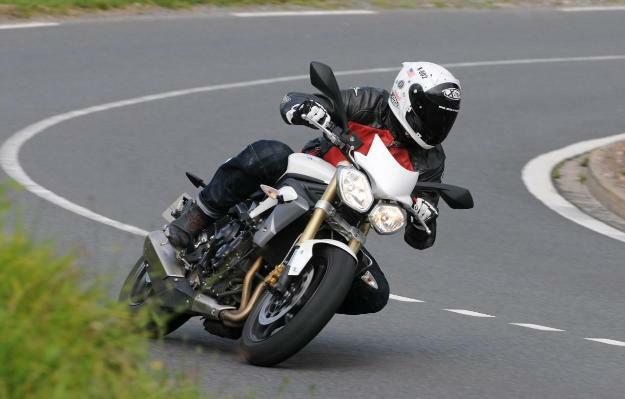 On a trace of hill climbing we love so much, the Triumph Street Triple 675 has given wings to everyone. Almost 90% of the time, this bike is a joy to ride. Nearly 90% of the time, this bike is a joy to ride. The remaining 10% due to small vibrations in the leg, the characteristic whistling its three legs that annoys some of his (still) too much firmness suspension. 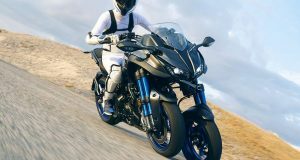 Yamaha FZ8 will continue his career with the Yamaha MT-09, although Yamaha Motor France will return more than Fazer8 Yamaha FZ8 2014 to allow air to three cylinders roadster. 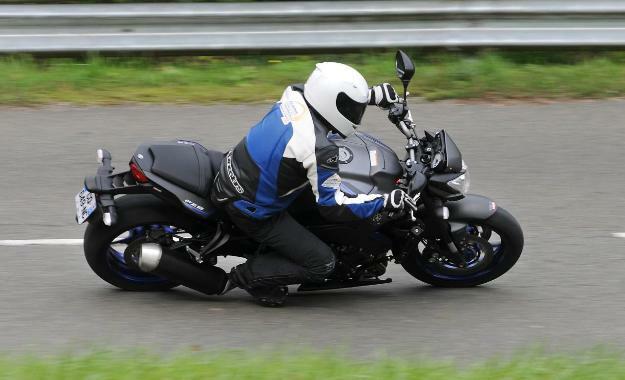 And for 2013, the little sister of the FZ1 received a technical update (exhaust, adjustable suspension and above). In fact, it is finally maturing. Certainly, side line, Yamaha FZ8 takes a slap. It was already classical at its exit; it becomes there only more master keys in 2014, even if she remains a nice motorbike, equipped well, with his frame aluminum and her matte painting. 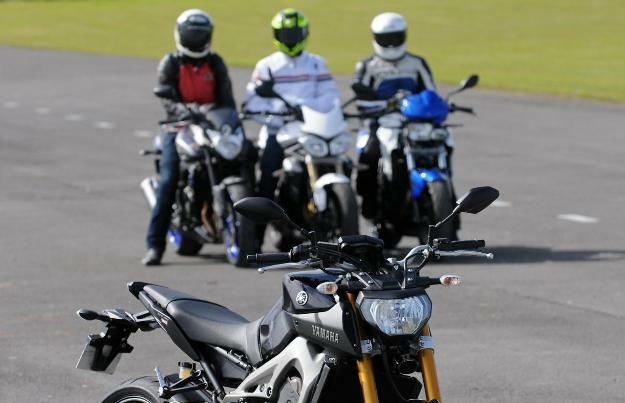 All our united motorbikes, Yamaha FZ8 are probably the most ‘basic ‘ and in any case the easiest to be surrounded. If they try the recent motorbikes, they find his marks immediately in the handlebar of Yamaha FZ8. 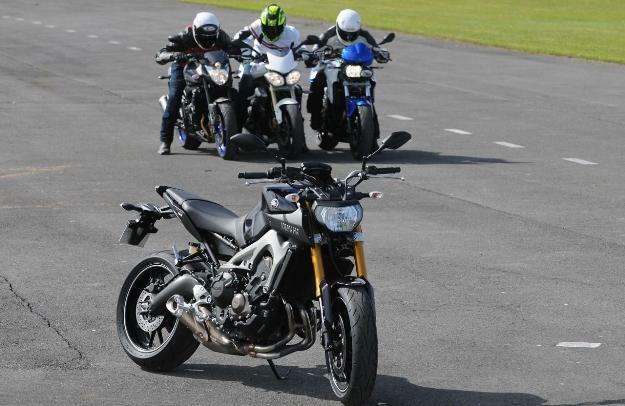 Obvious commands, very flexible and docile – unlike the Yamaha MT-09 mechanics that can offload its front wheel on a simple misunderstanding driver / handle gas…-, good turning radius: Yamaha FZ8 caters to as many as long as it has enough muscle to move its 215.2 kg all full facts. The selection of the box still nice little (since sound in the portion of the first, generating smooth and overall firm), but the Yamaha FZ8 is a good daily companion. On the road, the Yamaha FZ8 is before the serenity of its conduct. Well put on its axle assemblies, it offers an excellent road holding while its new suspensions him bring more precision on good or bad coating. 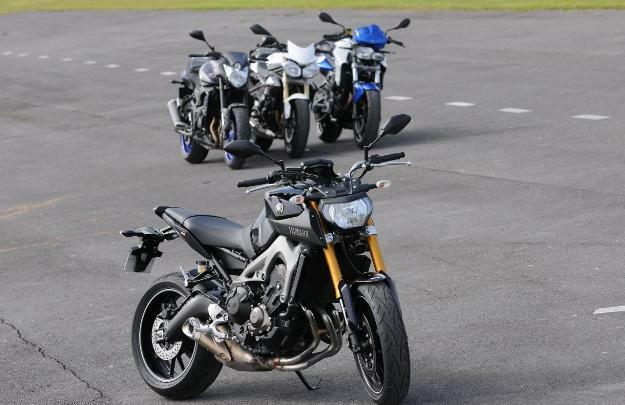 It absorbs much better the shocks that the Triumph Street Triple by example and his train before seems welded to the floor so that the new Yamaha MT-09 shows much more lightly to the front. Almost as soon its four-cylinder hollow mid-range penalizes approval as the times. Pins on the horizon? To keep up with the three-cylinder, you have to scream Yamaha FZ8 beyond 7000 r / min. As soon as the rate increases, the higher weight calls to order. The Yamaha FZ8 seeks more muscle to tighten the rope point, it takes longer to swallow the pif-paf, but at least its consistent general behavior reassures. In addition, the hollow at mid-range is followed by a fairly explosive extension which is expressed in full through the air box. Sporting four-cylinder fans will enjoy. Technically, the Yamaha FZ8 is quite close to all sports roadsters of the past decade, the Kawasaki Z 1000 first generation Yamaha FZ1. In addition, the mechanical basis of 1000 cm3 does not have the advantage on the scale. In fact, in terms of power / weight ratio, it is exceeded by the new wave including his cousin Yamaha MT-09 which shows more ‘punchy’ and fun to drive. 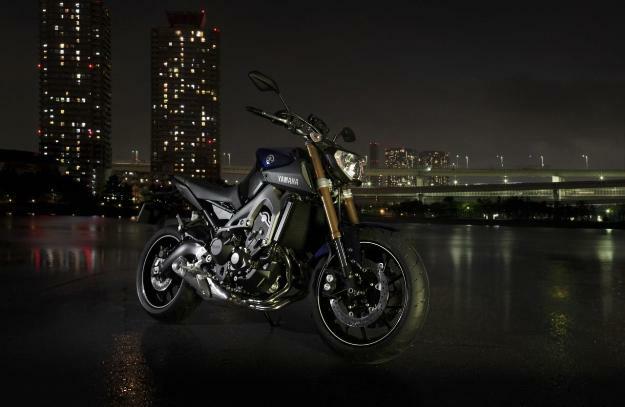 Yamaha FZ8 placed the costs of the newcomer. Enough to save the career of this bike finally accomplished? The year 2014 will tell. 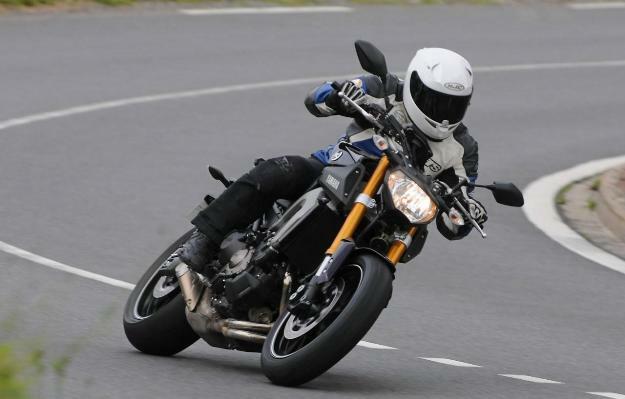 Yamaha MT-09: first attempt, master stroke! Just ask the Yamaha MT-09 alongside others to understand that it is the new 2014 … left to his controversy with sliced ​​design. There are those who love, and others. At least Yamaha finally returns to a distinctive style. On the manufacturing and finishing, good rubs worst a nice frame/swing arm assembly in die cast aluminum, a jumble look around the dashboard. Yamaha MT-09 continues to stand on the side of ergonomics, with finesse to the remarkable crotch, which allows to put both feet flat at 1.70 m. bust is more relieved than our other motorbikes by reason of a right handlebar and broad way big trail. On the other hand, the legs are folded hair and the more remote than on the other foot. But overall, the ergonomics of Yamaha’s MT-09 soft facilitates taking hands, everyone will find his account. 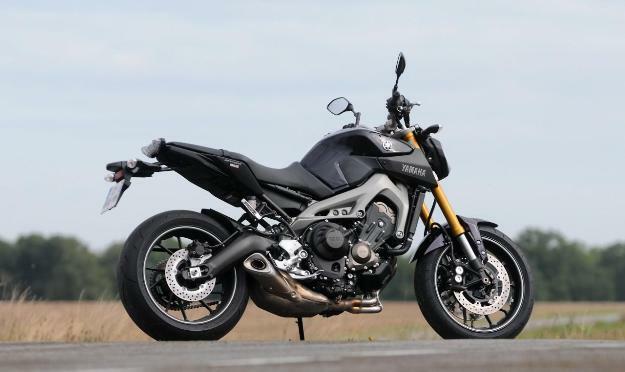 (Bad) unsurprisingly, with only 3 kilos more than the Triumph (189.6 kg all measured full facts), the Yamaha MT-09 is formidable in town: lightness, low center of gravity, fairly short turning radius, and position elevated dominant… how effective! But side approval this time, it’s another story. 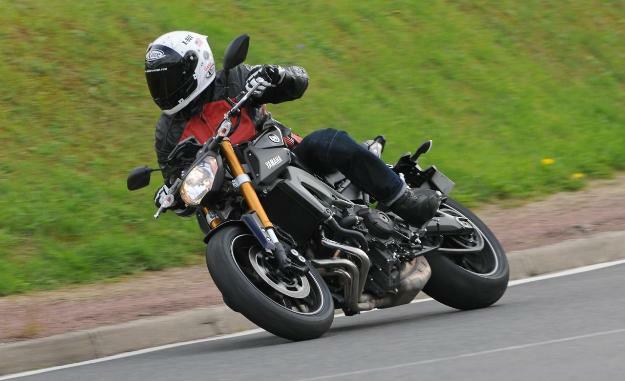 On the Yamaha MT-09, the ‘net’s gas’ is hard to find, and many even though spurts Yamaha Motor France had taken care to slacken the chain (too tense at the press presentation). To do worse, the selection is quite dry and the very beginning of the brake lever travel too abrupt. Refine, less for the driver comfortably also installed for the passenger perched on a beautiful Board bread. Five kilometers is sufficient to take the strength of the Japanese three-cylinder Face! While the Yamaha MT-09 takes advantage of its 172 cm3 more than the Triumph, which is not anything. However, this engine is a real success. Flexible, he knows how to resume very low like the others, but without the sweet side of the English. Bright, Yamaha MT-09 goes to plan faster than all the others and clearly pulling the arms starting at 4000 rpm where it already has 8 mkg torque! Finally, because even – more or less – powerful flanged, this block offers a more than sufficient extension before having to cut. Result: the Yamaha MT-09 dominates all others in times and Acceleration, only the Triumph reaching sometimes remains in contact. Overall keener that English, Japanese is also quieter, but delivers its power and torque more brutally. Therefore, use mapping in mode B to find the fluffy at the modulations of the accelerator. 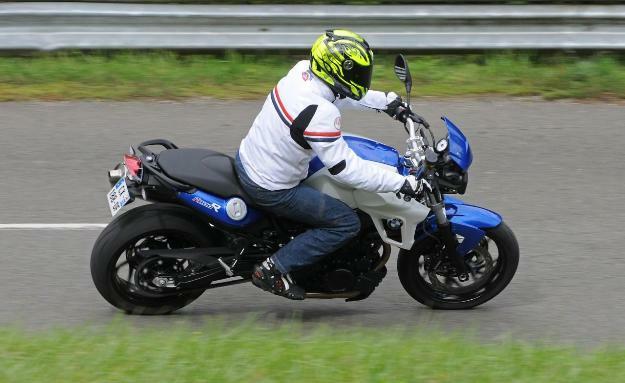 The Yamaha MT-09 surprising also in part-cycle. At the very beginning, heightened agility, and its soft suspension (fork especially, that debate on 137 mm 110 mm on the Triumph) impose the reserve. In sports use – whereby the engine calls constantly MT-09 suffers from a transfer of very marked masses, and the relative lack of feeling of the nose wheel. 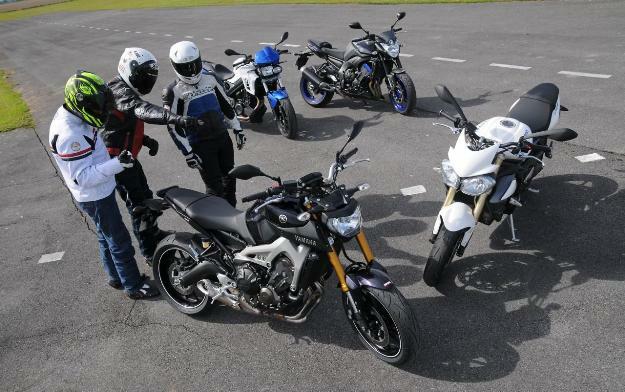 The lightness is not everything, and we had to learn to put the Yamaha MT-09 to take the quintessence. It is possible that the ergonomics, which does not allow loading the front axle as on the Triumph or the BMW, is also responsible for this slightly fickle behavior. If the Triumph Street Triple is shim of itself on the angle, the Yamaha MT-09 request for support purposes and do not cling to the handlebars. Suddenly, sports steering, Yamaha MT-09 requires the ‘technical knowledge’, some grafted to him maybe a steering damper. But in return, in rolled up driving fast, this bike became great thanks to his diabolical agility and addictive reminders of its engine that grows everywhere, all the time… Moreover, ransom his reporting weight/torque and driving on the back, the Yamaha MT-09 position dethrones the Triumph Street Triple for rear wheel! Not content to speak of it with his quirky physical, the new Yamaha MT-09 Announces perhaps a turning motorcycle production. And if the future of the roadsters it was that, a motorcycle ‘ platform’ doomed to evolve through declensions? 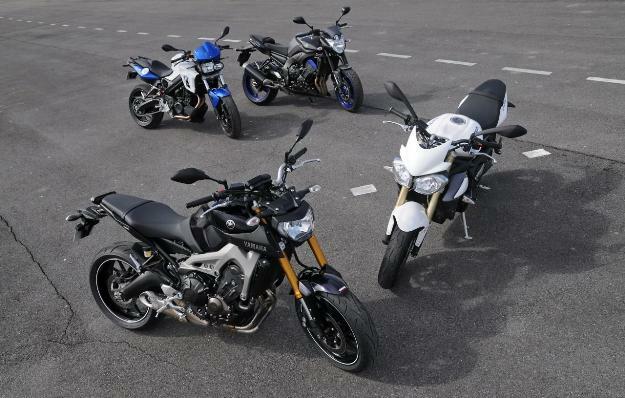 However, if Yamaha MT-09 is not better than a BMW F800R daily or a Triumph Street Triple on a sports path, it is singled out clearly to the conduct of all account categories. Already very promising in the State, she has not finished speaking of it, certainly. 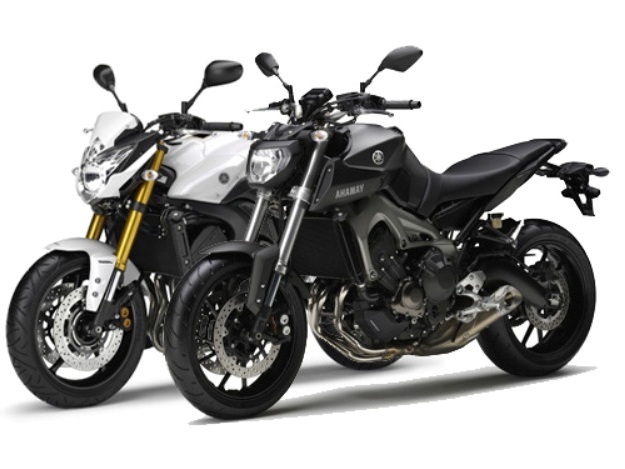 Yamaha FZ8 will continue its career at the sides of the MT-09 Yamaha MT-09 Vs Triumph Street Triple Vs Kawasaki Z800 Yamaha MT-09: 3-cylinders for all, finally! 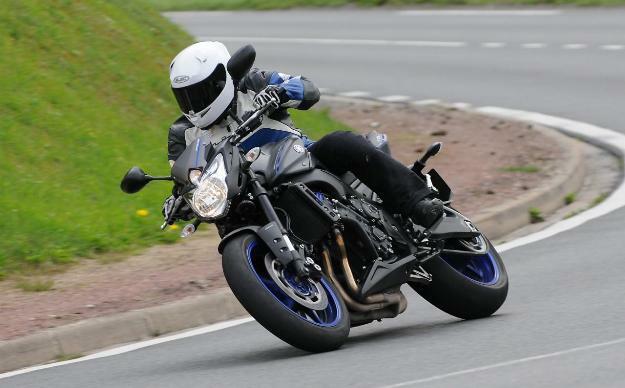 Test Yamaha MT-09 2014: Brilliant stroke!